Tripod Mode limits the Mavic Pro’s max speed down to 2.2 mph (or 3.5 kph) and 5.6 mph (or 9 kph) on the Phantom 4 Pro. This mode also dulls down your sticks so you can precisely control the drone which makes for slow precision flying. This let’s you achieve professional cinematic camera dolly-like shots just like the ones used to make movies. Think of Tripod Mode as putting your drone in a type of turtle mode where it moves very, very slowly. Tripod Mode currently works on the DJI Mavic Pro and the DJI Phantom 4 Pro. Tripod Mode works great when you are flying indoors where GPS signals are usually weak. But it’s also great for the times when you need super precise cinematic shots or my personal favorite when flying in or through tight spaces where you have very little wiggle room to pass through. In some situations, Tripod Mode can really help you be more confident when you are out flying because it’s much easier to control. So this essentially it lets you focus more on getting your shot opposed to worrying about how to fly perfectly. How to enter into Tripod Mode? Before starting you need to have the DJI Go app installed on your smartphone or tablet. Next, make sure your remote-control switch is in P mode which is also known as Positioning Mode. This is usually the default setting so there is a good chance you won’t have to do anything. Note: Tripod Mode does not work when in Sport Mode (S-Mode) or Attitude Mode (A-Mode). 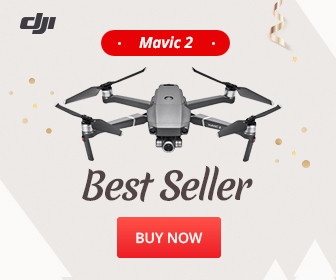 Then you need to get your DJI Mavic or DJI Phantom 4 Pro up in the air, otherwise you won’t be able to select the option within the DJI Go App. Also if you don’t see Tripod Mode on your app then you likely need to update your app since there is a chance you have an older version. Once you are up in the air, select the RC icon which is that little remote control icon on the left-hand side of the screen which is underneath the Return to Home button. This will then take you to the Intelligent Flight Modes menu where you can select flight modes like TAPFLY and ACTIVETRACK. For me, Tripod Mode is located on the bottom row right in the middle column but depending on what version your app is and what screen dimension your phone or tablet is this may look slightly different. Select “Tripod” and the drone will immediately enter into that mode. You can confirm that you did this right because at the top of the screen in-between the Flight Status and the GPS satellite read out you’ll see the word “Tripod”. It’s important to note that if you need to exit out of this mode either because you are done flying at a slow speed or because you quickly need to fly the drone back to you or away from an obstacle then you can return to normal flight mode by clicking the STOP button. The STOP button is located on the left-hand side of the screen right below the Return to Home button. Now, this next step is not necessarily required but if you are a more experience drone pilot then I want to let you know that when I am flying in Tripod Mode I like to turn off the Obstacle Avoidance sensors. You can do this by going into the menu settings and finding them listed under the sensor settings. If you don’t know how to do that check out my tutorial here. I do this because if I am flying really close to something like a tree, building, bush, baby-gate ;) or some other type of obstacle, then my drone won’t automatically stop because it thinks I am too close and might crash. If you watch the video tutorial above then you’ll see that I get really close to a few things but I always felt really in control and confident in the maneuvers thanks to the sticks being so finely tuned and precise. Think about the type of shot you want instead of just figuring it out once you start flying. Establish where you will start your move and where you’ll end the move. That way you can focus on just getting from point A to point B. Be really soft on the sticks so that you can better ease into your moves. Try walking right behind your drone so that you can better react to the sticks and so that you and your drone are facing the same direction which will make flying easier. Without the drone on, hold up your drone next to anything you are going to fly through just to make sure you understand how much clearance you have around the drone. Tripod Mode features for the future? I think it would be awesome to use multiple flight modes at the same time (when it was safe of course). What do I mean? Well, maybe it would be cool to use Tripod Mode and ActiveTrack if the subject didn’t move too fast away from the drone. I also think it would be awesome to choose the speed in case you needed it to fly a little faster. How to achieve Tripod Mode without a Mavic or Phantom 4 Pro? If you have an older drone you can try achieving this effect by going into your EXP Settings and manually adjusting the stick’s control curves. If you don’t know how to do that check out my tutorial here. Now the disadvantage is you won’t have a quick button to just enter and exit out of but it is one way to get the same effect. Hopefully DJI opens up this awesome feature to other drones since it can probably be done with just a software update. Well, I hope that is helpful for you! Tripod Mode is definitely something I am having a blast with and I highly recommend you check it out as well! If you didn’t get to check it out, watch my short clip which shows me flying my DJI Mavic through some narrow trails while in Tripod Mode. If I missed something or if you need something explained even more in-depth then please leave a comment down below and I will help you out! If you enjoyed this post could you please do me a HUGE favor? Could you please do me a HUGE favor and give it a thumbs up and share it? Just click the big social media icons at the very top or very bottom of this page. This blog is simply a hobby and labor of love and your support truly does help in keeping this website going! Max speed in tripod mode on p4p is 5.6mph. Just updated it, thanks Jeremy! What was the music for the last few minutes of the video?